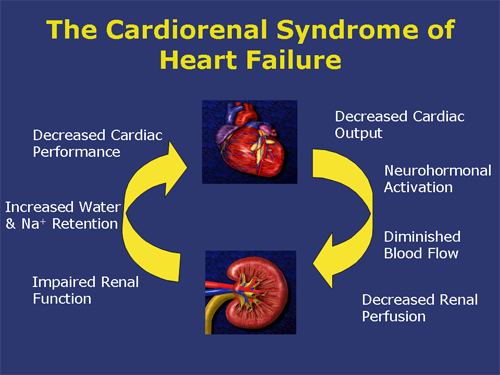 There is no definite definition of the notion Cardiorenal Syndrome (CRS). The National Heart, Lung, and Blood Institute defines the circumstances in which therapy to relieve symptoms of congestive heart failure is limited by the decline in kidney function. More broadly described as a state of moderate or high renal dysfunction, which appears in heart failure patients during therapy. Some say the CRS is the linkage of heart and kidney with the burden of excess fluid in which patients become resistant to diuretic therapy. Still little knowledge about the pathophysiology of CRS. Decrease in Cardiac Output (CO) in CHF that causes a decrease in renal perfusion, could be an easy explanation. But it has been shown that the decline in kidney function can also occur in ADHF. This contrasts with the statement that the decrease in ejection fraction will lead to renal hypoperfusion and then lead to kidney dysfunction. Thus giving the impression that the pathophysiology of renal dysfunction is more complex than simply decreasing CO. 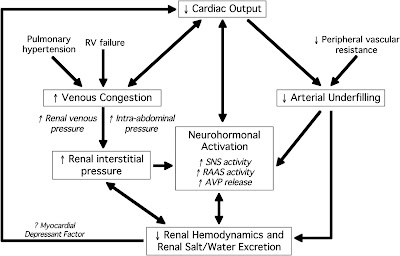 The model of Guyton explains the relationship component of the heart-kidney, namely Renin-Angiotensin System (RAS), the balance of nitric oxide and reactive oxygen species (NO-ROS), inflammation, and sympathetic nervous system (Sympathetic Nervous System (SNS)) the fourth called Cardiorenal Connection (CRC). When heart failure, a decline in CO and mean arterial blood pressure and renal hypoperfusion and activation of RAS occurs. In kidney failure also occurs inappropriate activation of RAS. In addition to volume retention and vasoconstriction occurs, one of the action on the RAS of the most damaging is the activation of nicotinamide adenine dinucleotide phosphate oxidase (NADPH-oxidase) by Angiotensin II, led to the formation of ROS. NADPH-oxidase have been found elevated in end-stage heart failure. Angiotensin II causes vascular inflammation via nuclear factor kappa B (NF-кB), which induces production and adhesion molecule kemotatik. RAS also increase sympathetic activity, the situation is found in renal failure. NO is important in the kidneys for the control of extracellular fluid volume and blood pressure by vasodilation, natriuresis and desensitasi tubuloglomerular feedback. In the CRS NO-ROS imbalance, namely increased production of ROS, decreased antioxidant and decreased NO. Impairment of antioxidants due to oxidative inactivation, decrease in antioxidant vitamins, and disposal of water-soluble antioxidants through dialysis membranes. Oxidative stress is the beginning of the inflammatory response by production (or activation) proinflammatory cytokines, particularly interleukin-1, interleukin-6, C-reactive protein and tumor necrosis factor-alpha (TNFα). These cytokines have an important role in the pathophysiology of atherosclerosis, the negative inotropic effect, cardiac remodeling and thrombotic complications. In vivo and in vitro in mice, oxidative stress increased preganglionic sympathetic nerve activity, increased Artrial Mean Pressure (MAP) and heart rate. Although not yet completely resolved, oxidative damage in renal tubular or interstitial cells may be involved in the feedback system of the secretion of renin and angiotensin formation in the CRS. Constraints on the synthesis of NO causes chronic cardiac regulation ACE and angiotensin II receptor, which may mediate inflammatory. It has been estimated to worsen inflammation of heart failure. In patients with heart failure, increased TNF-α and IL-6 found in plasma and myocardium and the nexus with disease progression. Interleukin-18 also terdapt in heart failure after mitral insufficiency. Role of activation of inflammatory cells certainly not very clear, but in CKD and heart failure are chronic inflammatory disorders. Low-grade inflammation can cause ROS production by activation of leukocytes to remove Oxidative content. The first SNS activation of heart failure by baroreflex to provide inotropic and maintain CO. However, excessive sympathetic activity can induce cardiomyocyte apoptosis, hypertrophy and focal myocardial necrosis. Hypertrophy in part due to direct action catecholamines, because some studies indicate noradrenaline induces hypertrophy in cultured cardiomyocyte. 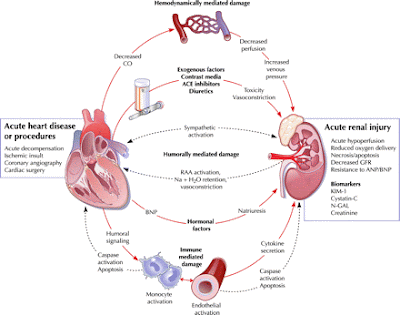 In chronic excessive sympathetic activity causes insensitive beta-adrenoreceptor in heart failure and kidney failure. This can cause disruption baroreceptors reflex, reduced heart rate variability decrease and increase state toward arrhythmia. Sympathetic effects on the kidney to increase renin due to prolonged excessive sympathetic activity has growth-promoting effects on intrarenal vascular wall. This effect is often found mediated by ROS production. SNS can induce inflammation by producing cytokine-mediated noradrenaline from liver and heart, and beta-blockade. SNS is also releasing neurohormon neuropeptide Y (NPY) involved in vasoconstriction associated with prolonged stress. NPY acts as a trigger of vascular growth, especially in neo-intima formation of blood vessels associated with atherosclerosis. NPY also affect the immune response that is changing the release of cytokines and immune cell function. So fourth cardiorenal connectors can enlarge the effects of the damage between each other with cardiorenal syndrome as a result. Until now there is no definitive medical management of heart failure in patients with kidney failure. Treatment is only based on clinical trials. So in this situation is more individualized therapy. ACE inhibitors are known to increase the survival rate in heart failure. However, this drug should be used with caution in renal insufficiency. The Cooperative North Scandinavian Enapril Survival Study (Consensus) shows patients with severe heart failure have increased serum creatinine (> 30%) when using ACE inhibitors. In most patients in which ACE inhibitor was stopped, creatinine levels returned to baseline. Consensus provides good evidence about the benefits of ACE inhibitors in patients with heart failure and renal insufficiency being. But the study did not include patients with severe renal insufficiency (GFR <30 mL / min per 1.73 m2), so that the efficacy and safety of ACE inhibitors in these patients is unknown. Use of diuretics in the CRS is still very controversial. Several studies have shown aggressive diuresis can worsen kidney function. High-dose diuretics were associated with increased mortality. Because diuretic therapy may worsen renal function and decreased kidney function causing poor results, then the diuretic resistance can be an indicator of poor prognosis of chronic renal failure. However because of lack of definitive data, patients with volume overload state should not barred from granting tiazid loop or diuretics to reduce symptoms. Some of the factors that create resistance diuretics include: inadequate diuretic dose, excess sodium intake, the late drug absorption, decreased diuretic excretion in the urine and increased sodium reabsorption in the nephron that are not sensitive to the diuretic. Overcoming resistance diuretic furosemide infusion can be given continuously, starting from 5 mg / h to 10 mg / hour, followed by intravenous thiazide diuretics (usually 250 mg or 500 mg of intravenous chlorothiazide). When deciding dose diuretics in patients with refractory edema, should be considered in several ways. First, the effective dose should be determined. Also, patients who did not respond with 20 mg of furosemide may not be past the threshold, then the dose should be increased to 40 mg instead of giving the same dose 2 times. Second, patients should limit sodium intake, because high sodium can prevent discharge despite adequate diuretic has been given. Third, patients initially may be given intravenous diuretics for preventing poor oral bioavabilitas due to decreased perfusion and gut motility and mucosal edema also can decrease drug absorption. High dose intravenous diuretics should be given slowly, over 30-60 minutes, to avoid ototoxic. Often the effort to increase blood flow to the kidneys and urine output to reduce the incidence of renal failure used low-dose dopamine (approximately 1-3 g / kg / min) or called renal dose. Low-dose dopamine is a non-selective dopaminergic agonists. This can improve renal function by vasodilation (D1 and D2 receptors), saluresis (D1), increased CO (β) and increased renal perfusion (α). In the experiment by the Australian and New Zealand Intensive Care Society of the effects of low dose dopamine (2 g / kg / min) in the kidneys which was conducted on 2 groups (dopamine group and the placebo group) concluded that no clinically significant protection of kidney failure. Research from The Digitalis Investigation Group (DIG) showed digoxin does not affect life expectancy, but reduced heart failure hospitalizations by 28%. There has been no research on the effects of digoxin in renal failure. To use the safe in patients with heart failure and renal insufficiency, digoxin should be used without a loading dose and with low maintenance dose of 0125 mg. If renal dysfunction in CRS mainly because of low CO, inotropic therapy experiments using dopamine or milrinon can be considered. But its use in CRS is still controversial. Until there is more meaningful data that this drug can be given at a low CO state for a brief period with the monitoring, because of possible risk of arrhythmia. B-Type natriuretic peptide (BNP) is synthesized in ventricular myocardium due to the response of the widening and overload. BNP mendilatasi arteries and veins, increase the excretion of sodium, and pressing RAS.3 Nesiritide is a synthetic form of BNP has been recognized Food and Drug Administration for the treatment of ADHF. Nesiritide has the effect of venous dilatation, and coronary arteries, reducing preload and afterload, increased CO without direct inotropic effects. causes natriuresis and dieresis, and suppress norepinephrine, endothelin-1, and aldosterone. At CRS, nesiritide study showed no effect on GFR, renal plasma flow, urine output and sodium excretion. Even in some of the data actually increase the risk of renal insufficiency in patients with heart failure. Further research is needed to determine the role and safety of nesiritide. Ultrafiltration or dialysis is used in patients with chronic volume overload resistant to therapy. Improve kidney dialysis and cardiac hemodynamic responses, but usually used as a palliative in end-stage CRS and can not be given to long term. By looking at the vagueness of CRS pathophysiology and therapy, these patients have a poor prognosis. Increased serum creatinine or decreased GFR is a poor prognosis. Prognosis worse if accompanied by oliguria, edema, hyponatremia, or resistant to diuretics. 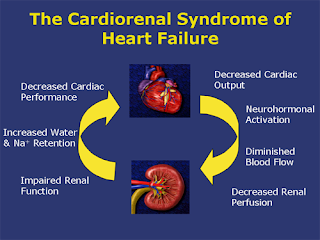 Cardiorenal syndrome is a state of interrelations between the heart and kidneys which leads to fluid overload, diuretic resistance and further involve the various systems that bring clinical circumstances will be worse. Cardiorenal syndrome have a unique and complex pathophysiology. Whatever the degree of renal insufficiency with a combination of heart failure is a challenge in the management of patients and is associated with poor prognosis. There are currently no selective therapy for cardiorenal directly affects the connection. Almost all of the current therapies have adverse effects on kidney function. Therefore, good clinical decision is needed in the management of patients. Hello guys,this is useful information for me.i love this blog.